The terms “subslab” or “sub-slab” soil gas refer to the air contained in soil or fill directly under a building’s lowest floor, regardless of whether the building has slab-on-grade or basement construction. Strictly speaking, subslab soil gas is present under building floors, but subslab soil gas also can be collected from under parking lots, roads, or other exterior pavement. Ideally, we’d measure indoor air directly, since indoor air is what receptors breathe. Unfortunately, indoor air consistently contains “background” contamination, (i.e., contaminants from indoor sources, such as cleaning products, paints, and in commercial/industrial settings, products used in bulk). Background often also contains benzene, toluene, ethylbenzene, ant toluene (BTEX) from outdoor air, especially in metropolitan areas. If vapors in the workplace are from VI, EPA has jurisdiction, but if they’re from products or processes, OSHA standards apply. Furthermore, most vapor-mitigation systems don’t eliminate background contamination, so early on, we need to figure out which chemicals in indoor air are from VI, and which are from background. Therefore, we first look at soil gas, and assume that indoor constituents that are absent in soil gas must be background. Soil gas is diluted as it mixes with indoor air, and vapor concentrations in indoor air are normally less than 3% of soil-gas levels. Accordingly, when contaminants are detected in soil gas, if their concentrations are sufficiently low (< 33x the indoor screening levels), indoor sampling might not be needed. Subslab soil gas is collected through a building floor, while exterior soil gas is collected away from the building. Exterior sampling saves having to drill holes in the slab, and it enables one to collect deep soil-gas samples using various types of drilling rigs. But soil moisture, oxygen levels, and other properties can be very different in exterior soil than in subslab, and the exterior vapor concentrations might not reflect what enters the building. Exterior soil gas is also more difficult to collect than subslab. To prevent outdoor air from diluting the sample, exterior soil gas is collected from a depth of 5 feet or more, which requires either a drilling rig, or lots of time and effort with a hand auger. In contrast, subslab soil-gas sample points can be drilled and installed in as little as 5 minutes using hand-held equipment. Subslab soil gas can be collected from something as simple as sample tubing jammed into a hole in the floor. But data will be more repeatable, and of higher quality if soil gas is collected from a sample probe made of nonreactive material, such as brass or stainless steel. Sample probes are often cemented into the slab, but Cox-Colvin uses Vapor Pins®, which are hammered in place and use a silicone sleeve to form the seal, making them fast to install and unlikely to leak. Immediately after installing a subslab point, we attach a pump and vacuum gauge to test for soil permeability. In the rare instance that the gauge shows a high vacuum while pumping, the soil is too tight to yield soil gas, and we install a replacement point nearby. Vapor Pins® are far superior in this way, because we can test points for tightness immediately after installation. Cemented subslab points and exterior soil-gas points generally cannot be tested or sampled until the following day. Additionally, we’ve found that subslab permeability is nearly always high enough to permit sampling. We’ve installed many hundreds of subslab points, and we found that only 1% or 2% are too tight to sample, compared to 25% or more of exterior soil-gas points, at least in Ohio’s glacial soils. Subslab soil-gas points are also easier to test for leakage than exterior points. We simply surround the sample probe with distilled water, and if the water doesn’t go down the hole, the point is not leaking. Water surrounding an exterior sample point will soak into the ground, with or without leakage. The speed with which subslab soil-gas points are installed makes them useful not just for VI assessments, but also for locating sources of contamination beneath a floor or other paved surface. 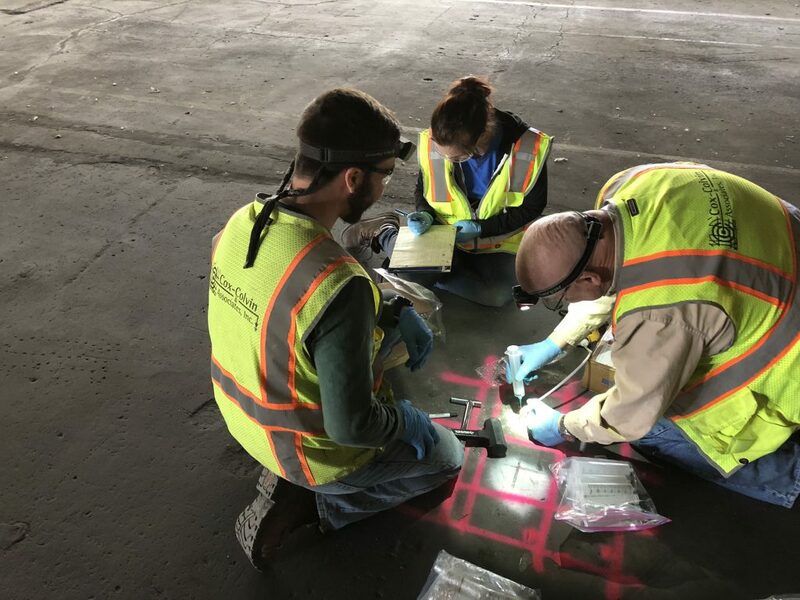 Most people conduct subslab investigations with the assumption that the contamination source is where chemicals were stored, such as in underground storage tanks (USTs), or where chemicals were used, such as a degreasing or painting operations. But because we’re able to install subslab points so quickly, we’ve thoroughly investigated a number of sites on a grid spacing, and find that contamination sources just as often correspond to former exterior doors, from the days when spent solvents were routinely dumped on the ground. Oftentimes, as a result of building modifications over the years, the back door becomes an interior door, and its potential as a source area goes unrecognized. Collecting subslab soil-gas readings in a grid configuration enables us to investigate large areas, and avoid being biased by our limited historical knowledge. Finally, one other advantage of subslab sampling is that subslab sample points installed without cement, including Vapor Pins®, can potentially be removed at the conclusion of sampling, decontaminated, and reused multiple times. Soil gas is usually analyzed with the same methods used for indoor air, which in the U.S., generally means EPA Method TO-15. TO-15 specifies Gas Chromatograph/Mass Spectrometer (GC/MS) analysis of samples from evacuated stainless-steel “Summa” canisters. But because soil-gas concentrations at source areas are so high relative to indoor air, smaller, less costly containers might also suffice. Disposable glass vials are easier to ship than canisters and cheaper, since they don’t have to be cleaned between samples. Cox-Colvin recently completed a source investigation at a multi-acre facility in Oklahoma that was slated for demolition. VI in the existing building was not a concern, but locating contaminated soil after demolition would have been costly. Instead, 4 people installed over 250 subslab sampling points in three days using hand-held equipment. All of the points were screened with field instruments, and 17 were selected for sampling and lab analysis. The picture below shows us using a disposable syringe to pull soil gas from a subslab point, prior to injecting it into a 22-milliliter glass vial. Because samples were analyzed by Gas Chromatograph (GC), which is more sensitive than the GC/MS, we were able to get relatively low reporting levels – too high for VI testing, but adequate to locate major vapor sources. We located a number of source areas; some were expected, some were not. Evacuated amber bottles up to 1 liter in size, including EnTech’s Bottle-Vacs®, are also useful for soil-gas sampling. Sample size is large enough in a 1-liter sample to meet most VI reporting levels. One limitation is that glass containers are limited to grab sampling, and they can’t collect soil gas over longer periods corresponding to commercial or residential exposure periods (8 or 24 hours). Sorbent samples, which we discussed in the August 2016 Focus on the Environment newsletter, are also gaining acceptance for VI sampling. Sorbent samples are essentially air samples without the air, making them extremely compact and easy to handle. Sorbents also are better for heavier compounds and low concentrations than whole-air containers, such as canisters and vials. Unfortunately, there are multiple sorbent types, which have to be matched to the compounds of interest. Sorbents are also affected by vapor concentrations, humidity, and other factors, which limits their usefulness for soil gas, especially in the early stages of investigation. Because of their simplicity and compact size, passive sorbents are often placed into holes in a grid configuration. But sorbent samples don’t provide field readings, and they must be analyzed at a cost of hundreds of dollars each. Passive sorbent samples, i.e., those that are collected without a pump, and simply soak up vapors from soil gas, provide the contamination mass, but not the concentration, since the amount of air the represent is unknown. Soil gas from subslab probes can be screened with field instruments, which limits the number of points sent to the lab, making large-scale investigations affordable. However you collect them, subslab soil-gas samples are an essential part of VI investigations, and they provide an excellent approach to locating sources of contamination.